Last weekend, Wisconsin’s Melvin Gordon broke LaDainian Tomlinson’s 15-year-old single-game rushing mark by two yards when he went for 408 against Nebraska. That record lasted for all of a week as Oklahoma’s Samaje Perine went for 428 yards in the win over Kansas. Who knows what this week will bring? 10. Georgia (9–2): With his 113-yard rushing performance against Charleston Southern, Georgia freshman running back Nick Chubb now has six straight 100-plus rushing yard games since Todd Gurley was suspended and subsequently injured. A nice substitute to have. 9. UCLA (9–2): The Bruins beat the Trojans on Saturday for the third straight time in their LA rivalry and effectively knocked USC out of the Pac-12 title game in the process. UCLA quarterback Todd Hundley had four TDs in the 38–20 win while passing for 326 yards. 8. Michigan State (9–2): After blowing out Rutgers 45–3, the Spartans are now sixth in the nation in scoring at 43.9 points per game. In their only two losses, the defense betrayed them, giving up 46 points to Oregon and 49 to Ohio State. 7. Ohio State (10–1): Buckeye dual-threat freshman quarterback J.T. Barrett posted his third game of 300-plus passing yards and 70-plus rushing yards in the 42–27 win over Indiana. He needs just 151 rushing yards to reach 1,000 for the season. 6. TCU (9–1): Up until their four-point win over lowly-Kansas, TCU likely had the better resume between one-loss programs outside the projected four playoff teams. Their only loss was to Baylor, but it was on the road and the Horned Frogs led for most of the game. 5. Baylor (9–1): Though Baylor throttled Oklahoma State 49–28, the scoring output actually dropped their season average to 50.0 points per game—tops in the country. Quarterback Bryce Petty had multiple TD passes for the seventh time this season. 4. Mississippi State (10–1): The Bulldogs showed their mettle Saturday by thrashing Vanderbilt 51–0, following their crushing loss to Alabama. They’ll likely have just one more opportunity to lock down their playoff worthiness this weekend. 3. Florida State (11–0): The undefeated Seminoles are a bit of a mystery. The team has won 6 of their 11 games by single digits, but even more concerning is their schedule. Only their overtime wins against Clemson and then a 42–31 victory over Louisville (both 8–3) were against worthy opponents. 2. Oregon (10–1): Oregon quarterback and Heisman hopeful Marcus Mariota threw two more TD passes Saturday in the 44–10 thrashing of Colorado. He’s now thrown for at least two scores in every game this year and has a 32–2 TD-interception ratio on the season. 1. 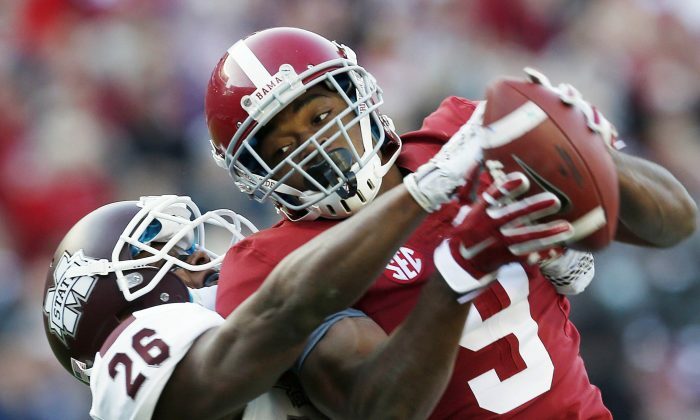 Alabama (10–1): If the Tide do make the playoffs, they’ll have definitely earned it. As if this week’s Iron Bowl against Auburn won’t be hard enough, they would then have to get past either Missouri or Georgia in the SEC title game. A loss in either game would likely end their chances.